Valentine’s Day ideas are showing up everywhere! 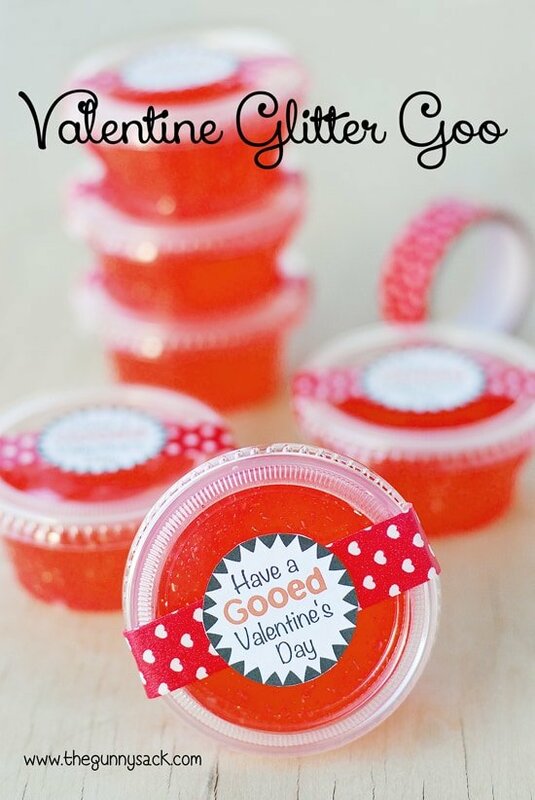 This Valentine Glitter Goo is easy to make with Elmer’s Glue and Borax and can be given as a party favor. Last summer, I hosted a princess party for a bunch of little girls and one of the activities at the party was to make Princess Putty. One of my readers recently asked me a question about that post and earlier that week I had just come across a container of princess putty in our art supply closet (and it was still in perfect condition after more than 6 months). So, with both of those incidents fresh in my mind, I figured this would be the perfect time to make some Valentine’s Day Goo. 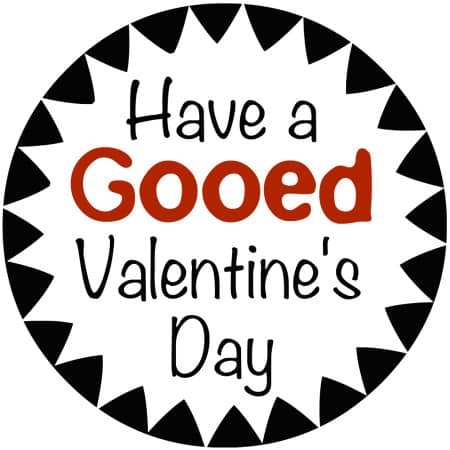 I’ve included a free “Have a Gooed Valentine’s Day” printable below. The goo is made from a mixture of Borax (like this http://www.20muleteamlaundry.com/), water and Elmer’s Red Glitter Glue which I found it at Target right next to the regular glue. Pour the entire bottle of glue into a large plastic bowl. Add 1/4 cup of water and mix together. In a separate bowl, mix together 1 cup of warm water and 1 teaspoon of borax. Pour Borax mixture into the glue bowl. Mix the glue and borax mixture together and once it comes together in a clump, knead and remove it from the watery mixture. Continue kneading until it is rubbery. Then, divide it in into 6 small storage containers. 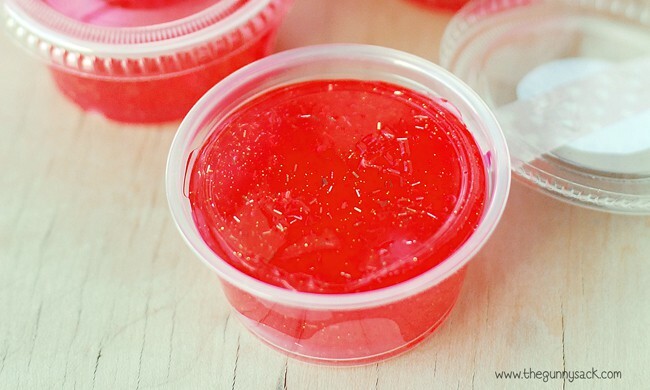 I used 2 oz disposable condiment cups called Diamond Multi-Purpose Mini Cups With Lids, that are available at Walmart and Target. Hold the containers closed with a piece of washi tape. I found this red tape with hearts in the dollar spot at Target. 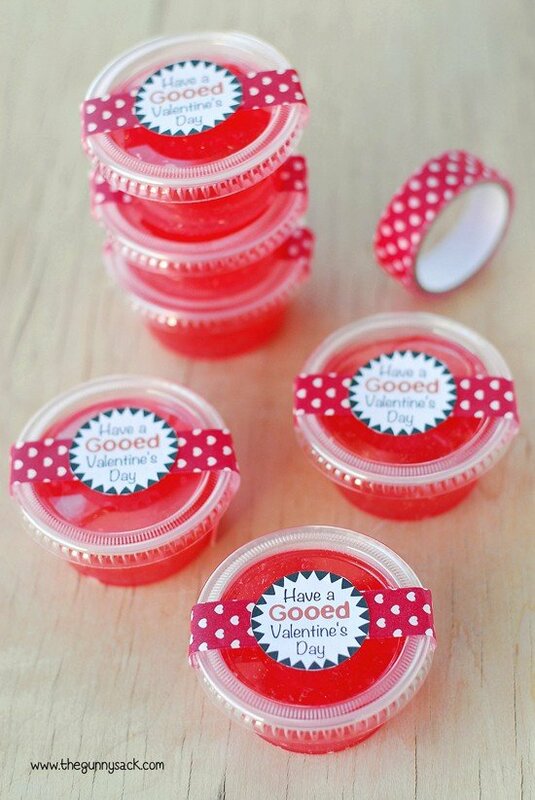 Print out the “Have a Gooed Valentine’s Day” labels and attach them to the containers with a glue dot. Pour the entire bottle of glue into a large plastic bowl. Add ¼ cup of water and mix together. In a separate bowl, mix together ¾ cup of warm water and 1 teaspoon of Borax. Then, divide it in into 6 small storage containers. Maybe I’m misreading, but I can’t find a description of what this mixture is FOR. I wish I had read your comment before making…so true. Sad little 4 yr old. We’re calling it unicorn poop to make her feel better about its non stretchy state. Thank you! This was fun to make. Is it supposed to be sticky? It seems to be sticking to everything. I’m making these for my class and I don’t want parents complaining. I’m so late to the party but I have made this slime with both white glue and glitter glue. The glitter glue always seems more sticky and gets stuck to hands. I would suggest using the white glue with a bit of red food colouring. You’ll get pink cuteness without the mess. I seem to be having trouble making a full sheet of the labels on ribbit. Can you offer any instructions? I’ve never used it before. Thanks! We made this last year and totally love it! We keep it in sealed sandwich bags. I recently noticed it is a bit more sticky than it used to be. Do you have any ideas about what I could add to make it less tacky now? 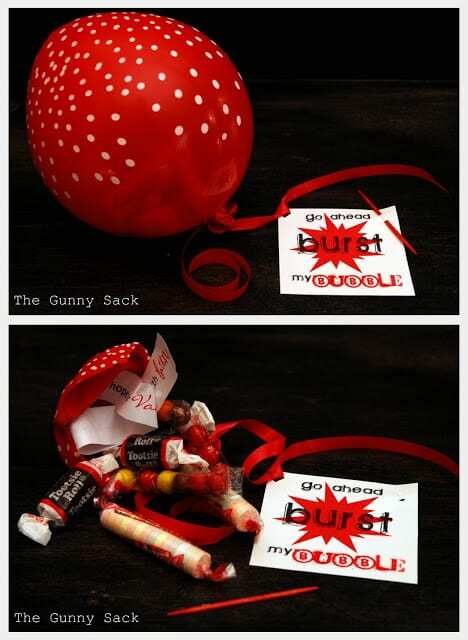 Im featuring your glitter goo on my Valentines gift round up. The post should go live sometime tonight. I used 2 oz disposable condiment cups called Diamond Multi-Purpose Mini Cups With Lids, that are available at Walmart and Target with the disposable food storage items. I don’t think the terms borax and borox are interchangeable– isn’t borox used for insecticides, like in boric acid, and borax is the washing powder? Don’t want people to mix them up! Hi. Just wondering if its supposed to crumble in my hands or is it supposed to be like slime? Ours is rubbery and does not crumble in our hands. We can roll it into a ball and bounce it on the tabletop. The longer you keep it in the Borax mixture the harder it will be. How far in advance can you make this? Will it dry out easily if we make it several days ahead of Valentine’s Day? Yes, you can make it early. I recently found some glitter goo that we made last summer and it was still perfectly fine! 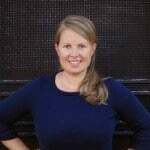 This is such a great idea, Tonia – my kids would go crazy! 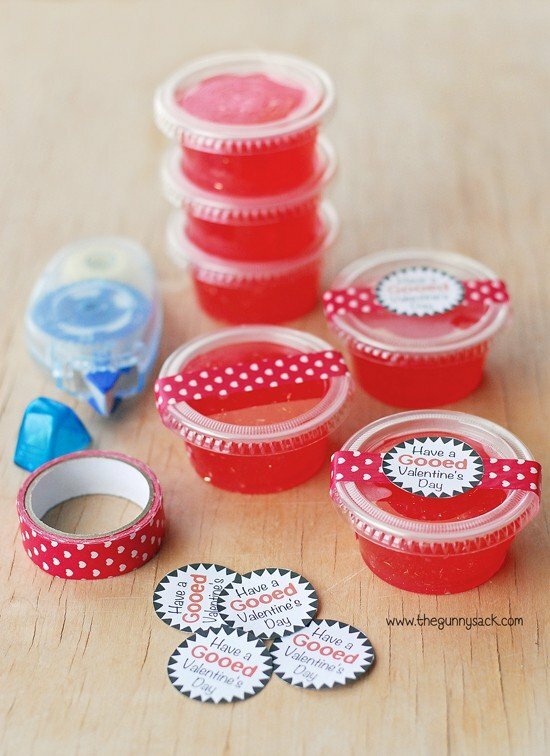 love a good goo recipe! i especially love your use of the wee condiment tubs. Brilliant! I was going to make play dough for my preschool class but methinks I may gave to goo it up! Thank you for sharing! Thanks Jessica! The kids at my Valentine’s party loved it! 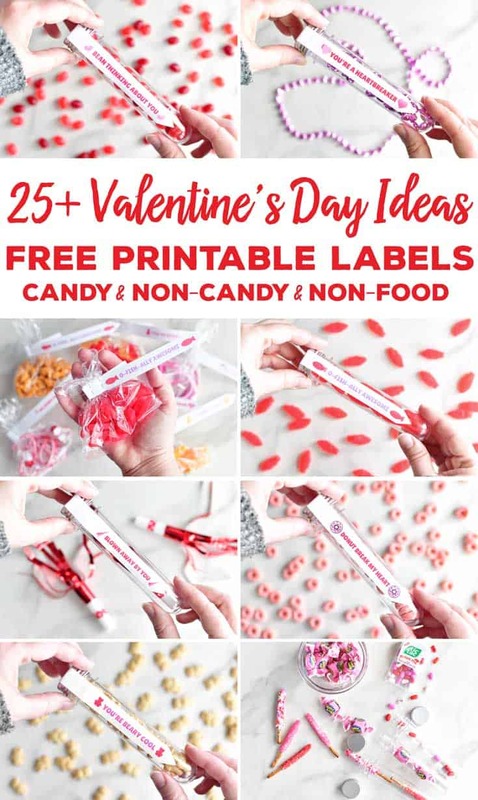 We love making this, Tonia….and I love the adorable Valentine’s Day tag!! So cute!